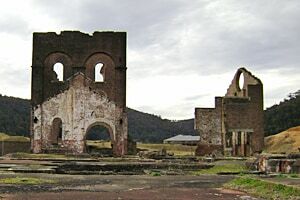 NSW Archaeology On-Line holds information about the archaeology and heritage of important cultural places in NSW, such as this historical smelter in Lithgow. Researchers from the Faculty of Arts and Social Sciences at the University of Sydney, in partnership with local professional archaeologists and the University Library, have created NSW Archaeology On-Line - the first resource of its kind in Australia. NSW Archaeology On-Line, which launches today, is a digital archive of information about the archaeology and heritage of important cultural places in New South Wales. For the first time the archive makes a collection of previously unpublished reports discoverable, searchable and publicly accessible online. It has important implications for research, education, heritage interpretation and management. Dr Sarah Colley and Dr Martin Gibbs from the Department of Archaeology at the University are the co-directors of the project. Commenting on the reason the archive is being established, Dr Colley said, "Archaeology conducted under the New South Wales Heritage Act since 1977 has produced a vast record of information including incomplete or fragmentary archaeological site documentation, personal notes, reports in limited circulation, photographs and reference material. "Until now there has been no central repository where archaeologists can lodge these records. Most have never been placed in a library or archive and records only exist in the private collections and libraries of the individuals who conducted the work. "As the first generation of working archaeologists retires their record of work is at risk of being lost. "These circumstances have made it hard to develop new projects based on previous work and made access to information useful for community and public education projects impossible," she said. The archive currently contains information about important places and sites already on the State Heritage Register. It is equally important for the wide range of information it will be able to provide on other places related to key NSW historical themes including transport, technology, education, health, industry and migration as well as the development of towns, suburbs and villages. "We are proud to announce that the Heritage Council and Department of Planning has now approved funding for the second stage of this project. It will allow us to expand the types of content such as images, maps, video, audio and databases of information," Dr Colley said. The project is an initiative of the Archaeology of Sydney Research Group in partnership with University of Sydney Library who have international level expertise in sustainable digital archiving. Sustainability is a key feature of the resource and the library will maintain the content so that it will always remain accessible and can be moved into whatever software applications are invented in the future. The Archaeology of Sydney Research Group is a collaboration between academic staff and Honorary Associates of the Department of Archaeology at the University of Sydney, including professional archaeologists and practitioners based in the Sydney region.